A selection of New Zealand’s best male singers come together to perform a high energy fully choreographed show consisting of Broadway songs, Motown favourites along with some of today’s big hits. Ideal for Corporate events, after dinner shows, Awards nights, Weddings and high end functions. Available as a trio or quartet. .
"New Zealand's Boys of Motown” is a modern twist on that distinct soul-pop sound that is Motown. Featuring familiar faces from many of New Zealand's and Australia’s touring musicals including; Jersey Boys, The Choice, Book of Mormon, Wicked, Hair Spray, Xanadu, Rocky Horror Picture Show, Grease, Fame, Australia’s TV Hit The Voice, Coca Cola Christmas in the park & many more. 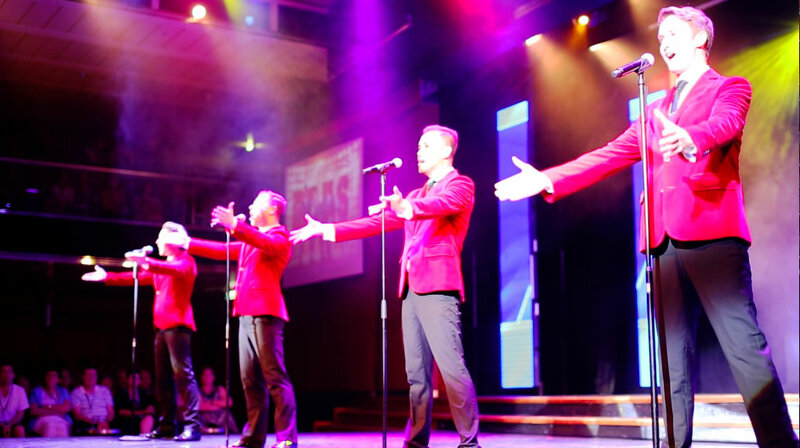 These boys blend the world’s best known originals, covers and remakes of Motown with current chart hits in one crowd pleasing Motown inspired spectacle! A fully choreographed show with live vocals & sharp suits to match, this show is an interactive crowd pleaser. Start the night off with some Motown classics and then watch the boys kick in the night with some of music’s most current Motown inspired hits. The standard corporate show is 25 - 30 minutes which we find is the perfect length. We can vary the show length on the odd occasion if it really suits the event to do a bit more or less i.e. extended to 45 minutes feature length show or broken into 2 x 15 - 20 minute shows. For each client we gain a feel for the event and see what might genuinely work for that particular event. Let us know your thoughts and we’ll do our best to work in with you. Michael Jackson/Jackson 5 - ABC, Blame it on the Boogie, I want you back, can you feel it & more..
Jimmy Barnes (originally Jackie Wilson) - Higher & Higher"
*Songs and set list will vary dependent on show length & event feel. Please feel free to contact us for more information or to check availabilty for this busy group. Tech information and show riders can be sent through upon request.